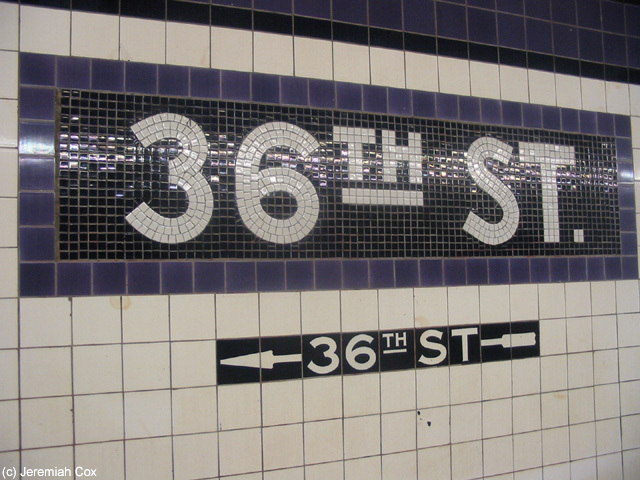 36 Street is a local subway station along the industrial areas beneath Northern Blvd. The station has two side platforms on the four-track IND Queens Blvd Line. Just west of the station the 63 Street Connector joins the line, coming up a flying junction so trains can reach either the Express or Local tracks at ease, without interfering with the other track. East of the station the express tracks leave the local tracks and fallow their own ROW via Northern Blvd, instead of the local tracks roundabout way via Steinway Street up to Broadway. 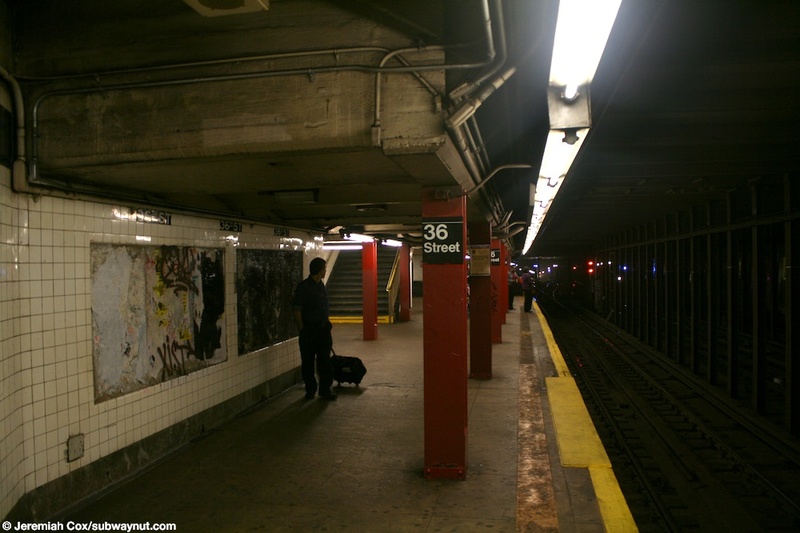 The station itself has two side platforms, each with red I-beam columns, although there very few actually along the Forest Hills-bound platform. The station's trim line is purple with a narrow black boarder. 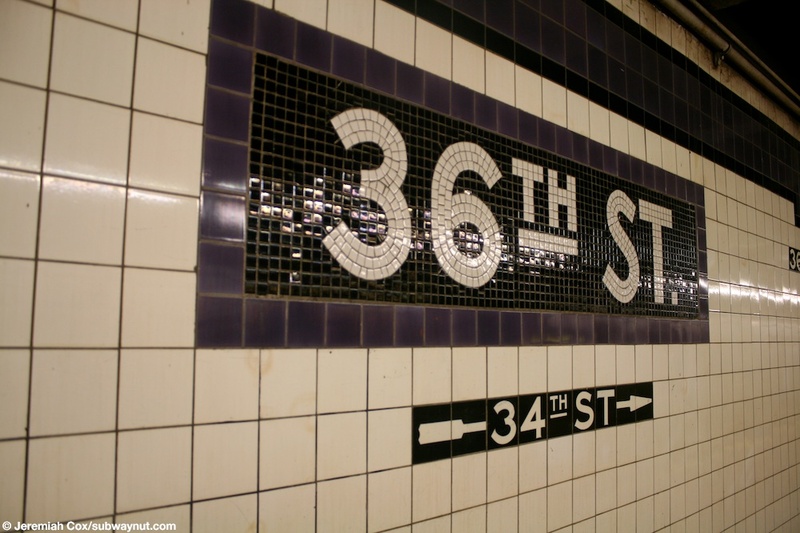 36thStreet is tiled just beneath it. 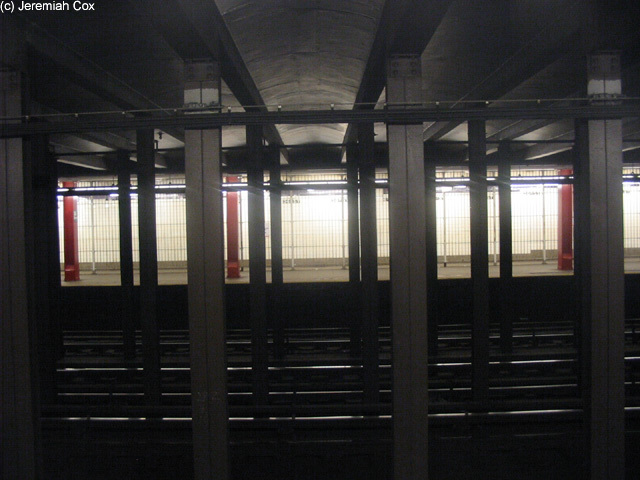 The trimline on the Forest Hills-bound ends in places because the platform's ceiling gets so low. The name tablets have purple boarders with white text on a black background. For station exits no free crossover between directions is provided. 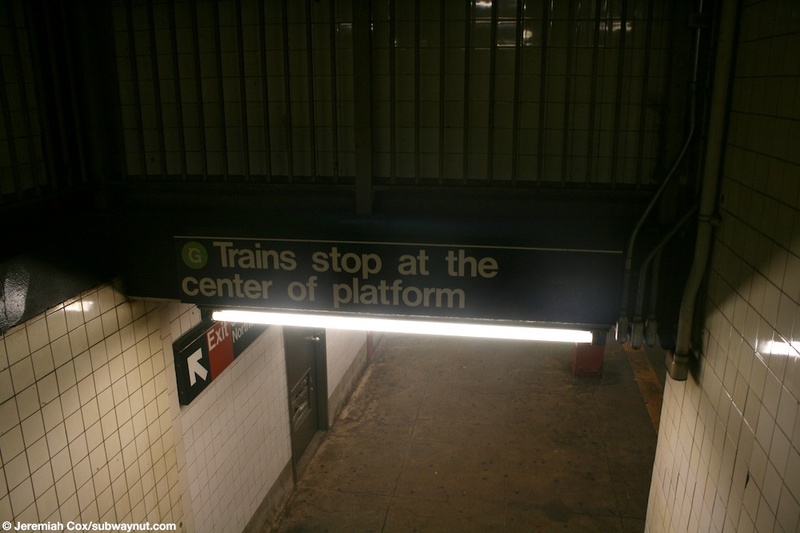 The Manhattan-bound platform has too exits, the full time entrance with the token booth and turnstiles is placed directly on the platform, towards the middle of the station. 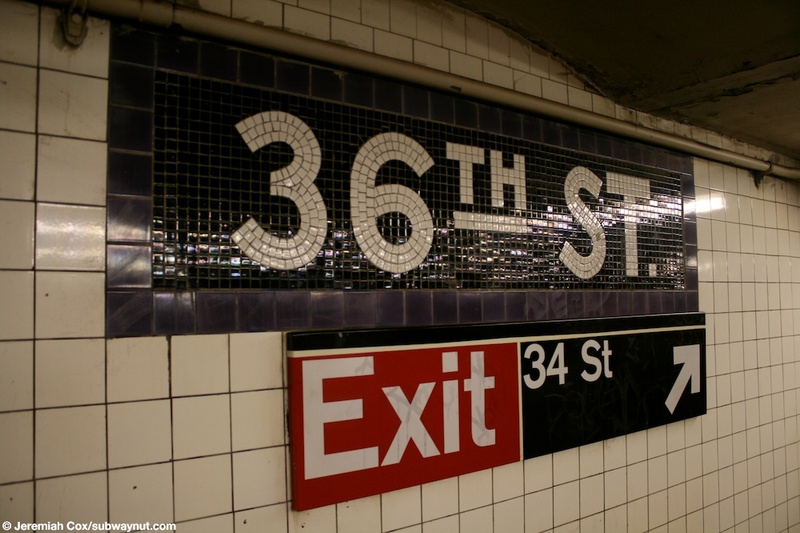 This exit has two street stairs that lead up to the three way intersection (both streets end at Northern Blvd) of 38 Avenue and 35 Street. One is at the NE side of the intersection, the other at the NW side; both street stairs are along Northern Blvd. 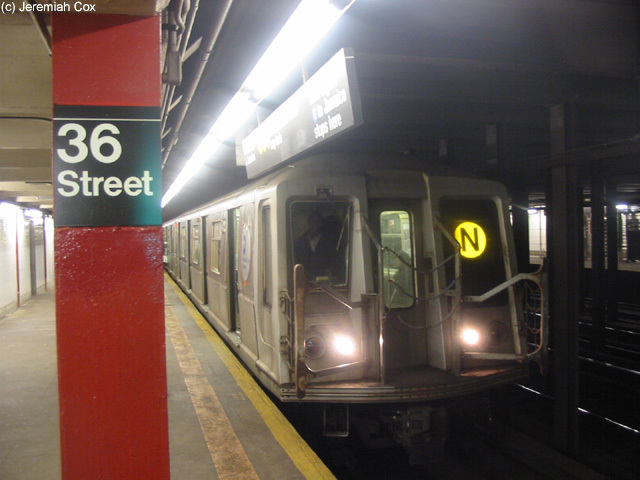 This platform has a secondary exit at the extreme eastern (railway northern end) of the station, a High Entrance Turnstile leads out to a street stair at the NE corner of 36 St & Northern Blvd. 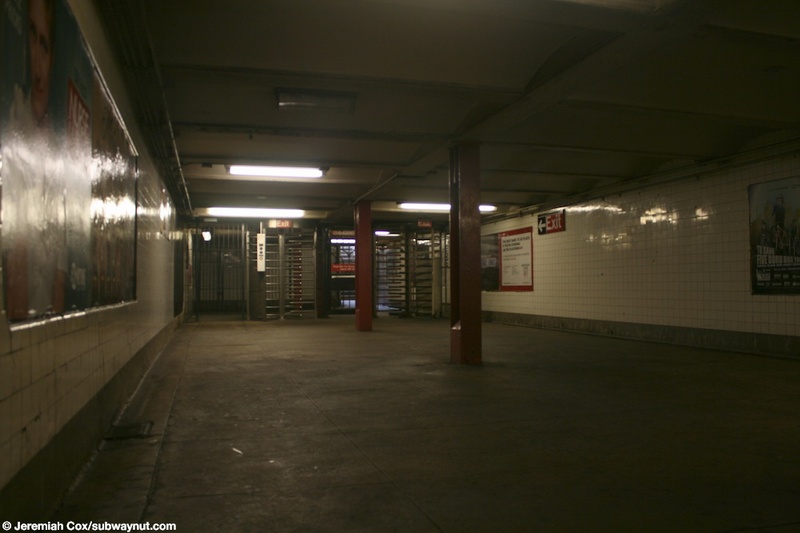 This exit has a connecting, in the form of a narrow fenced off passageway along the wall of the Manhattan-bound platform to the full time turnstiles at 35 Street. The exits from the Forest Hills-bound platform are both on their own little mezzanine areas. At the extreme southern (western) end of platform two staircases lead up to High Entrance Turnstiles and a part time bank of regular turnstiles that lead to a single street stair along the south side of Northern Blvd just east of the intersection with 34 Street. A single staircase at the extreme northern (eastern) end of the station leads up to another small landing area where there's a High Entrance/Exit Turnstile and a High Exit Turnstile that lead to a single street stair along the south side of Northern Blvd between 36th & 37th Street. 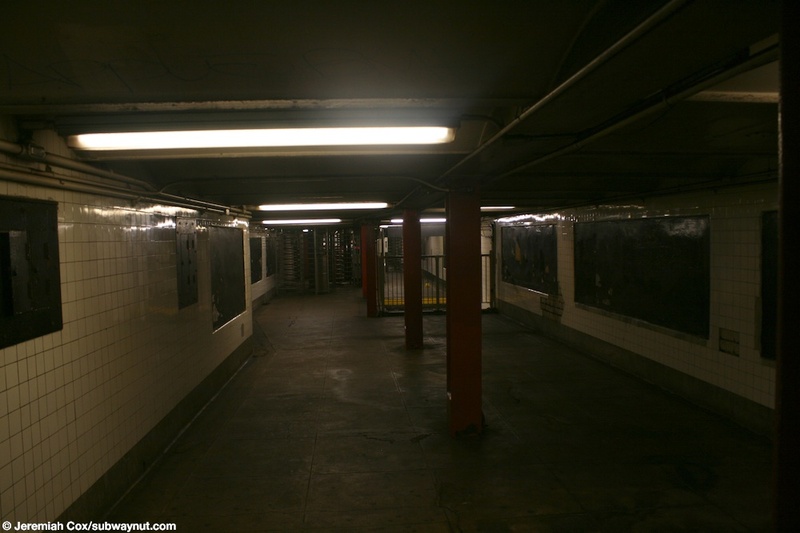 There is some evidence in the form of a newly tiled over wall with doors as well some sings saying Exit 36 Street, that cover where the exit arrows should be in the middle of the platform, that there is a now closed exit to 35 Street. 29 February, 2004 (36r2) A 36th St name tablet with an exit arrow beneath it for the exit to 36 St.
29 February, 2004 (36r3) Looking across the tracks at 36 St to the fenced passageway on the Manhattan-bound platform. 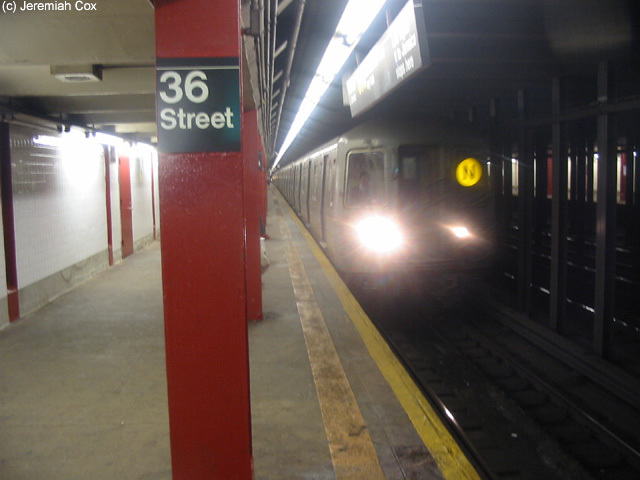 29 February, 2004 (36r4) A R68 N trains blurs into 36th Street, passing the area on the platform where there was a closed exit to 35 Street. 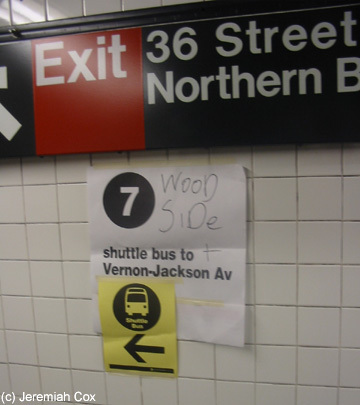 (36r5) Signs for the Shuttle buses, for N train to 39 Avenue (really only three blocks away) or the 7 train to Woodside where 7 train service resumes. 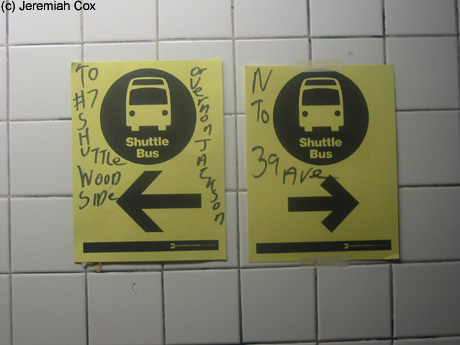 The designation of which shuttle bus is witch has been written in with Sharpie. 29 February, 2004 (36r6) More shuttle bus signs that have actually been printed saying where the buses will be going. 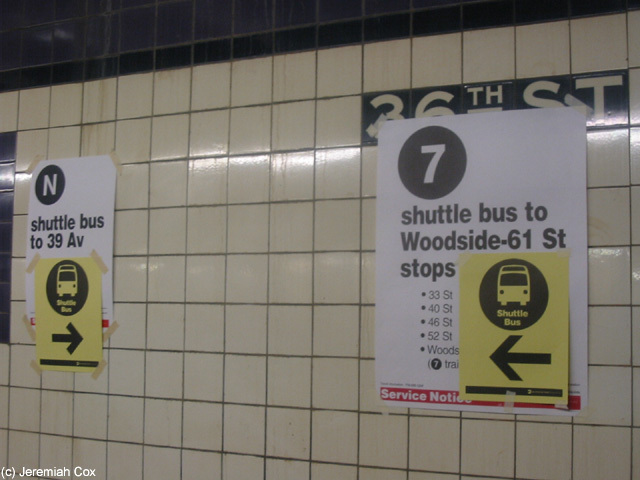 29 February, 2004 (36r7) Another shuttle bus sign, this one is for the 7 train's Long Island City Stations (it isn't running except from Woodside to Flushing). 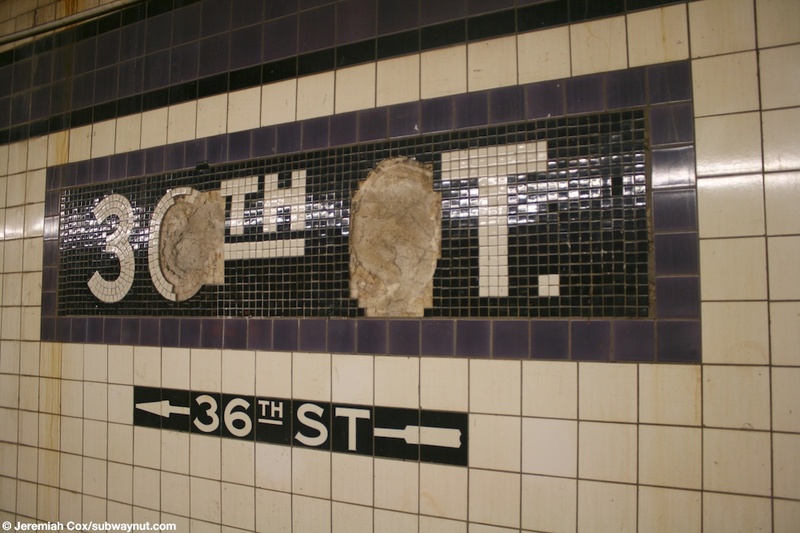 29 February, 2004 (36r8) A 36 St name tablet, exit arrow tiling beneath it for the 34 St exit. (36r9) Looking down the Forest Hills-bound platform at 36 Street, towards the staircases up to exit at its back end to 34 Street. 4 June, 2009 (36r10) A 36th St name tablet, its exit tiling has been covered over with an older font sign for the exit to 34 St, because it was for the closed exit to 35 St.
4 June, 2009 (36r11) The small mezzanine area with its two staircases up from only the Forest Hills-bound platform lead up to the exit to 34 Street. 4 June, 2009 (36r12) Mosaic tiles are falling off a name tablet at 36 Street. (36r13) Looking down the small mezzanine on the Forest Hills-bound platform that leads to the unstaffed exit to 36 St.
4 June, 2009 (36r14) A sign informing passengers arriving to the Forest Hills-bound platform at 36 St that G trains stop at center of platform.